On January 9, 2018, Representative Ruth Kagi (D-Seattle) was recognized for her leadership and dedication to improving the lives of families and children with a Casey Excellence for Children Award for Leadership. The Casey Family Programs is a national foundation working to give children and families more opportunities and reduce the need for foster care. The Casey Excellence for Children Awards for Leadership recognize leaders who have demonstrated distinguished work, exceptional leadership and relentless dedication to improving the lives of families and children. Since joining the legislature in 1999, Representative Kagi has focused on improving opportunities and outcomes for all children. During her first year in the House she co-sponsored the HOPE (Homeless Youth Prevention /Protection and Engagement) Act which provides services and housing for youth experiencing homelessness. Last year she led a successful effort to restructure the state child welfare system and create the new Department of Children, Youth and Families. Representative Kagi was instrumental in creating the Department of Early Learning and her advocacy has increased the quality and availability of early learning across the state. The new Department of Children, Youth and Families will build on the success of the Department of Early Learning. Additionally, Rep. Kagi has championed innovative policies and funding for programs that improve the lives of children and young people. She championed increased access to mental health services for children, better support for foster parents, and lower caseloads for social workers. As a member of the Appropriations Committee, she has secured a wide array of budget items to improve the lives of families, youth, and children. You can read more about all of the 2018 Casey Excellence Award winners here. 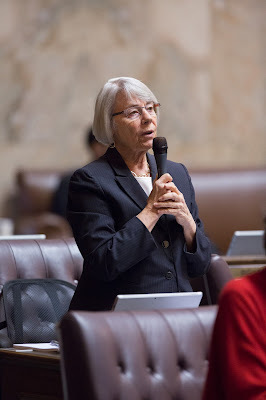 Rep. Ruth Kagi, D-Seattle (32nd Legislative District), represents part of King and Snohomish Counties, including Lynnwood, Mountlake Terrace, Shoreline, and part of Edmonds.